Siliguri: Trinamul organised a huge rally in Siliguri on Friday, a day after a key party leader joined the BJP at a public meeting attended by Mukul Roy and state BJP chief Dilip Ghosh. 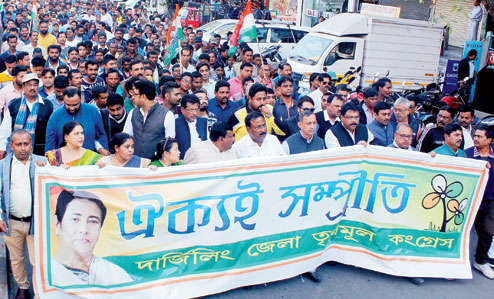 State tourism minister and Trinamul district president Gautam Deb denied suggestions the rally was aimed at countering the BJP's push, saying the ruling party's event had been pre-scheduled for Friday. Political observers believe, however, that the frequent visits of BJP leaders to north Bengal and Thursday's rally - Roy's first in the area since he joined the BJP last month - has challenged Trinamul. According to them, Trinamul will have to flex its muscles with such rallies to reaffirm its support base in a region where the BJP is trying to make inroads. "The BJP's meeting in the heart of the city has given a fresh challenge to Trinamul. Apart from other parties' leaders, a senior Trinamul leader from Dabgram-Fulbari joined the BJP (on Thursday). The area is in Jalpaiguri district," an observer said. "Panchayat elections are to be held next year. Considering all these facts, Trinamul's desperation to prove its support base is obvious, which prompted them to organise the rally here (on Friday)," the observer added. However, Deb squashed speculation that his party's rally was an effort to counter BJP leaders' frequent trips and Thursday's meeting in Siliguri. "The decision to hold a rally here was taken about a month back. The rally was against divisive forces and to send a message for unity. It has nothing to do with the BJP's political programme. To my knowledge, they decided to organise the meeting here only a week ago. Being a national party, they are free to conduct their political programmes," Deb said, speaking before Friday's rally started at Bagha Jatin Park. Asked about Sikha Chatterjee, a former state committee member of Trinamul and party's member of Rajganj Panchayat Samiti, joining the BJP at the BJP rally, Deb said it was her "prerogative". "I have not denied that she was with us from the very beginning. If she had any issue with the party, she could have raised it with the district leadership or a higher forum. Instead, she decided to join BJP, which is absolutely her prerogative and I don't want to comment on her decision. All I can say that Trinamul is a mass-based party and it never depends on any individual," Deb said. Bagha Jatin Park, where the Trinamul rally was held, was also where the BJP leaders had gathered fortheir meeting on Thursday. Trinamul sources said the district leaders held its core committee meeting here on Thursday evening where Deb was also present. During the meeting, he issued instructions to ensure massive participation of party workers for the rally from different parts of the city and its vicinity. Trinamul is scheduled to hold its Panchayati Sammelan at Bidhannagar, around 35km from Siliguri, on January 4. Trinamul organised a huge rally in Siliguri on Friday, a day after a key party leader joined the BJP at a public meeting attended by Mukul Roy and state BJP chief Dilip Ghosh.